Image from Wikipedia is by Evgenia Kononova. 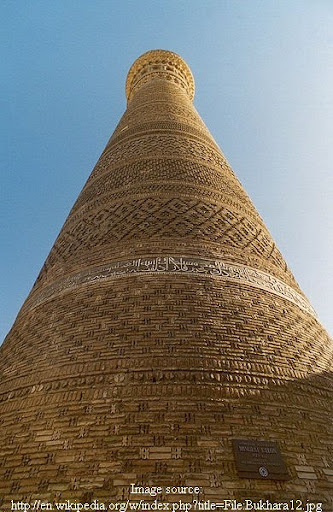 This beautiful looking minaret known as Kalyan Minaret is the most important landmark in the ancient town of Bukhara - A city located on the Silk Road and a center of trade, scholarship, culture, and religion. Built in 1127 the tower was the only structure which survived the razing of the city ordered by Genghis Khan in 1220. As per local legend, Genghis Khan was so awe struck with the exquisiteness of the tower that he specifically forbade its destruction. As per another legend Genghis Khan's hat fell down as he looked up to the top of the minaret and by reflex action he bent down to pick it up. This was taken as a sign of bowing before the minaret and the minaret was spared razing. The Minaret is made of of burnt brick with plaster mortar and has a height of 45.6 metres, base diameter of of 9 meters which tapers to 6 meters. It is topped with sixteen-arched skylight rotunda and its entire height is decorated with 14 parallel bands none of which are repeated. The tower has a brick spiral staircase built around the central pillar and provides access to the rotunda. 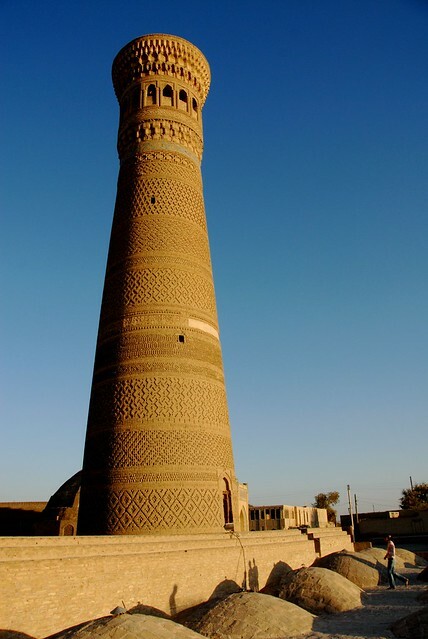 Unfortunately during the eighteenth and nineteenth centuries the Emirs of Bukhara used the minaret to throw the condemned persons to death from its top and it acquired the name of "Tower of Death". Today this outstanding work of architecture, the perfect architectural forms of which have long served as an example for similar works in the East Asia, still remains the tallest minaret in the East Asia.